One key element in the success of your business is making sure that you always put your best foot forward. If a client is coming to your office building for an important meeting, you need to make sure that it is accessible, visually pleasing, and welcoming. A parking lot full of garbage is a quick way to turn potential clients away. So how can you leave a good first impression on your clients? Invest in parking lot sweeping in Cupertino today. We’ll make sure that your parking lot is debris-free and easy to access for your employees and customers. Our sweeping vehicles quickly whisk away dirt, leaves, and other debris, leaving behind a perfectly clean surface. We remove built up oil, sand, rocks, and other tripping hazards so you don’t have to worry about any employee injuries. Do the right thing for your business and for the environment. 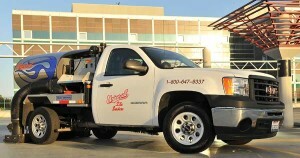 Call Universal Site Services today to invest in our Cupertino parking lot sweeping services. understand that you don’t want our service vehicles disrupting your daily routine. That’s why we offer 24 hour services, meaning we can provide parking lot sweeping in Cupertino at the time that works best for your business. We can remove graffiti, repaint your building exterior, clean out your storm drains, and more. Avoid a dingy, overgrown, or flooded office park by allowing us to maintain your office building and parking lot. You won’t regret it. Invest in the success of your business – invest in our full line of property maintenance services today.